After a stressful January, I welcomed February with a more positive perspective. January was really a challenge for me and admittedly I lost couple of pounds (not the kind that you wished for). I looked thin and dry and well, stressed. So as part of getting myself back together after my anxiety episodes, I just had to regain the fats that I’ve lost. However, I must have overdone it. I initially thought it was a Japanese restaurant because of its name Shibuya, the famous crossing in Tokyo. We were surprised when we get inside and they don’t offer maki or sushi (lol) instead they have this Ferrero Hazelnut Toast, Beef Bulgogi Nachos, Kani Mango Salad and Crispy Pork Belly with Kimchi. So, I don’t really know how to classify this restaurant (help?). Nevertheless, I’m glad that we went inside and tried it out. We liked everything that was served to us. And I will definitely come back! One thing people might not know about me is I enjoy eating alone. I know most people hate it, but I find it fun. 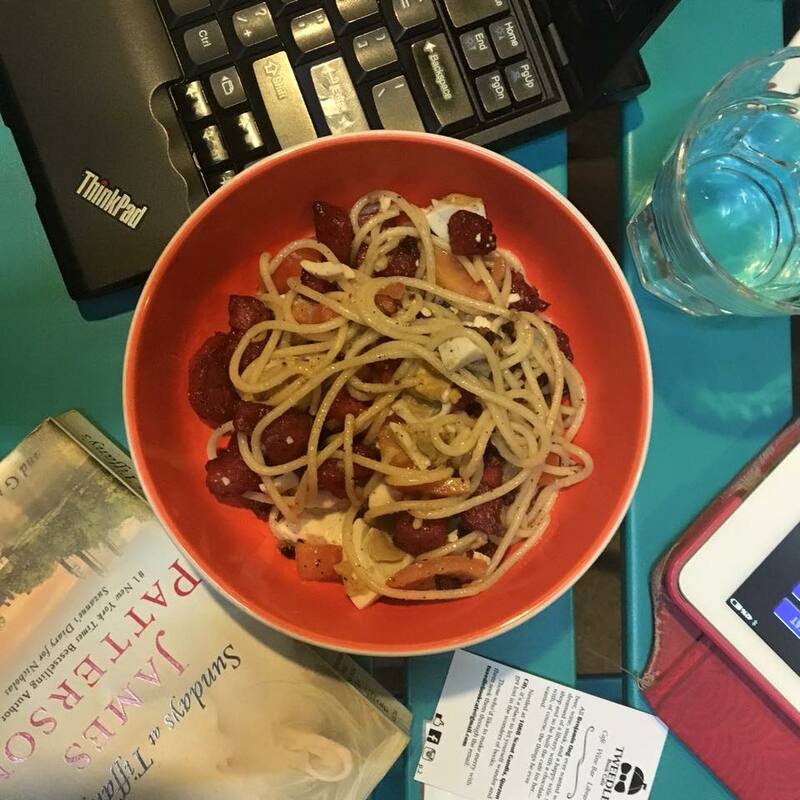 It is an activity where you can contemplate on how you’re doing with your life and at the same time indulging in one of the best things in life, eating. Hah! So, one day in February, I need to go Market, Market as early as 6pm and my shift is at 10pm, so I decided the best way to kill my time is to eat. I’ve never eaten at The Old Spaghetti House before so I don’t know what to get. I decided to try their Buffalo Chicken Tenders with Bleu Cheese Dressing and Penne with Grilled Chicken Inasal. Just after my first bite I instantly regret why I never tried this restaurant before. The food was awesome. I have to remind myself to slow down because I still have 3 hours to spare. 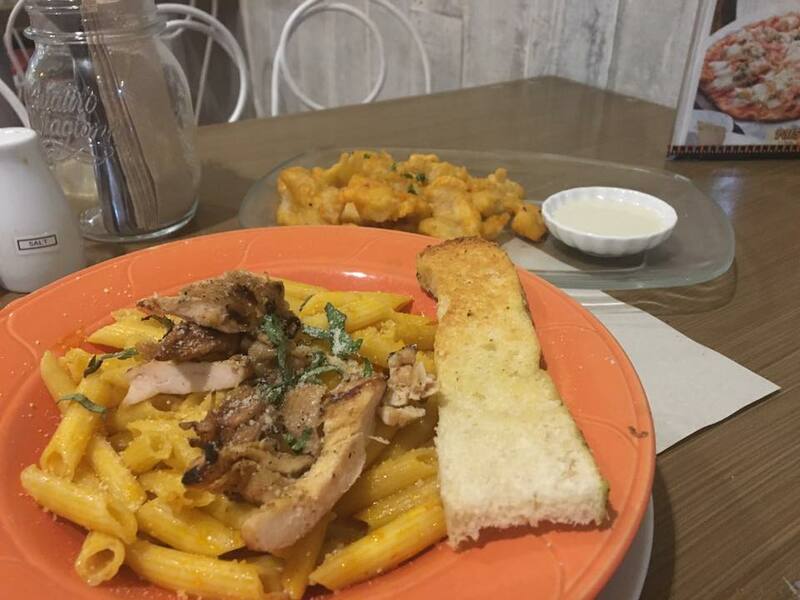 If you’re like me who loves chicken and pasta and hasn’t tried this restaurant before, what are you waiting for? Go! After my me-time dinner at The Old Spaghetti House, of course I craved for dessert. That month, I already had 3 DQs, so I was looking forward to something different. I happened to pass by this stall in Market, Market. 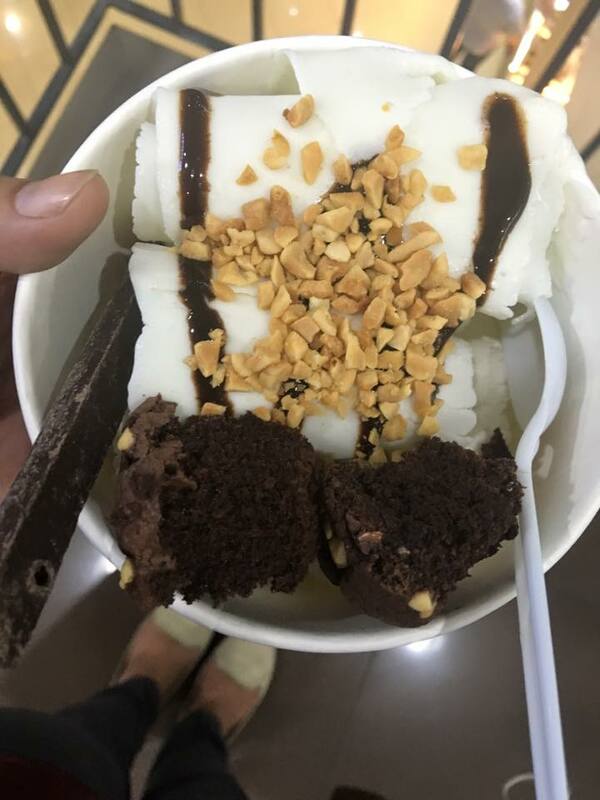 I know this Miguelito Ice Cream (I love it when I am broke, hahaha). But this one particular Miguelito stall offers fried ice cream. I remember I tried this when I first visited Market, Market I think I was in highschool at that time (circa 2006/7). If this is the same stall, wow they’ve been there for almost 10 years!? Anyway, so I paid 50 for this. I get to choose the flavor of my ice cream. They have lots of flavors to choose from but I only remember vanilla, chocolate and bubblegum. Then you get to pick your toppings either from the Chocolate Bar, Pastry Bar and Candy Bar. Of course, I wanna try everything, so I chose the FIC 4, which means I get to pick my toppings from all of the bars! There, so to conclude, I had vanilla ice cream with chocolate syrup with brownies, pretzels and nuts as my toppings. I LOVE RAMEN. That is a fact. But among all the ramens I have tried, this one is my absolute favorite. Imagine, this ramen has all my favorite breakfast food in it. It has spam, bacon and egg! I know right? 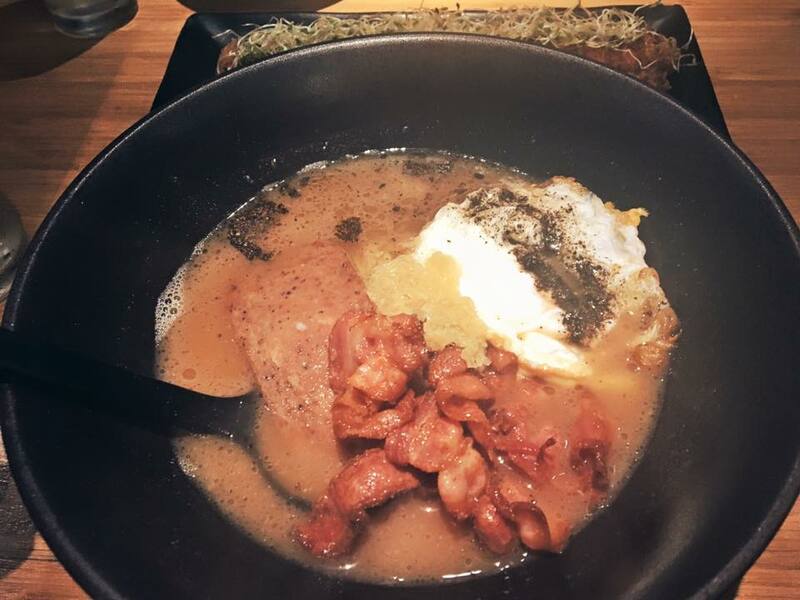 It is not your usual ramen and I often got asked if it doesn’t taste weird. Guys, nothing goes wrong with bacon, so this is definitely good! Hah! I encourage you to try it if you still haven’t. The person I was with then hates ramen, but she likes this one. Yay! By the way, they call this FU Ramen. Go give it a shot. First thing first, THIS DESERVES AN ENTIRELY DIFFERENT BLOG POST. And I will get to that. Probably after 6 months. Hahaha! Anyway, so my sister and her med school friends have this Thursday habit wherein after their Thursday duty (it ends at 10am) they would go out and eat. 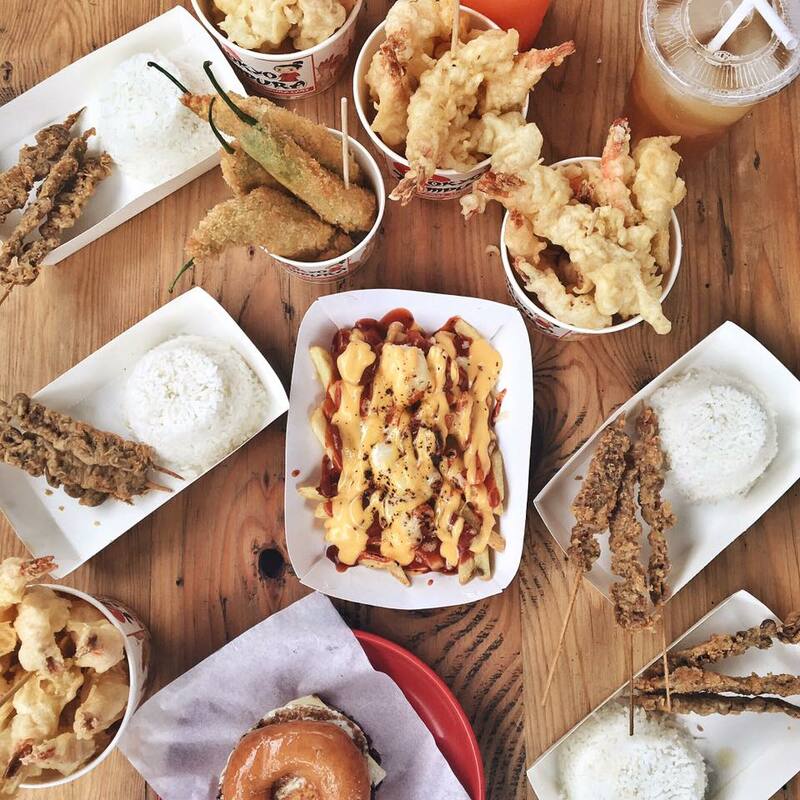 Being the saling-kitkit sister, I invited myself and suggested the GastroPark in Kapitolyo. Good thing, the food was good or else they would hate me for their 2 hours commute from QC to Pasig. So here is my flatlay (no, I wasn’t standing on my chair, I was just tiptoe-ing) but I am so proud of this flatlay. Anyway, I’ll just go through our orders. 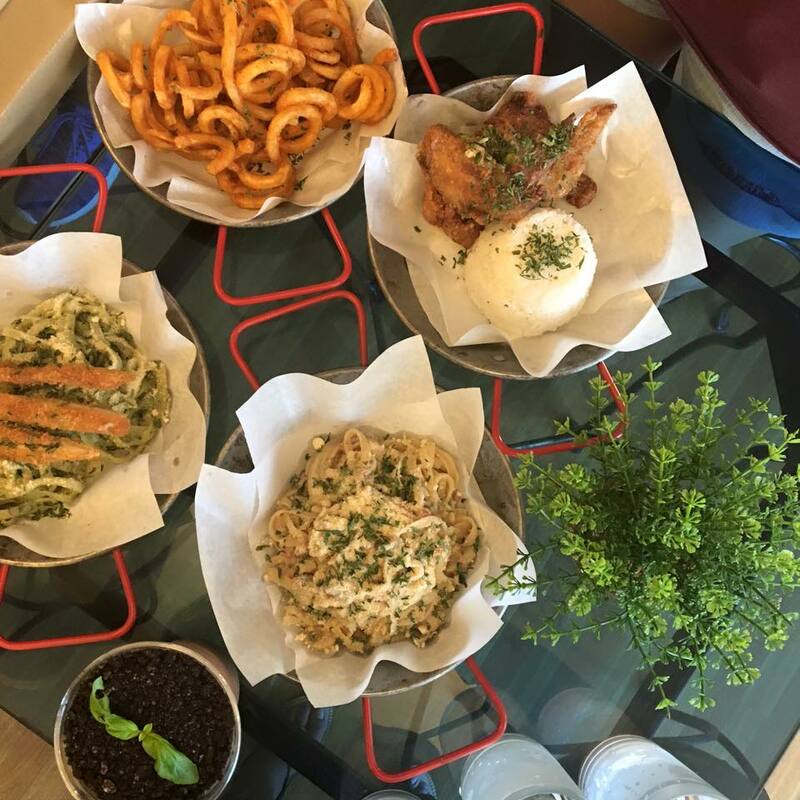 We ordered Tokyo Tempura’s Tempura and Dynamite, Stuffed By Offbeat’s Donut Burger, Chixy9’s Isaw, Surfries’ Kaboom and for dessert, The Seventh Element’s Oreo and Cheesecake Nitrogen Ice Cream. My favorite? The Oreo and Cheesecake Nitrogen Ice Cream and the Donut Burger. Ever since I heard and saw photos of Tweedle Book Cafe, I knew I have to visit it. What I like about the place is it’s not yet crowded (maybe because it wasn’t known to many yet), they have cool and artsy place and they have a wide range of books that you can borrow. So one day in February, I accompanied my sister to study and I suggested this place. The place was quiet and conducive for studying. To entertain myself, I ordered their Pinoy Breakfast Pasta. It includes longganisa, itlog na maalat and tomatoes. It was just okay for my taste. I think I would love it if it’s saltier (haha, I am biased because I love salty food). I would definitely go back but maybe I will try the other pastas they offer. The highlight of my visit, probably, was when I found Sundays at Tiffany’s and their Magnetic Poetry board. It was Valentines and almost all the restaurants were crowded. 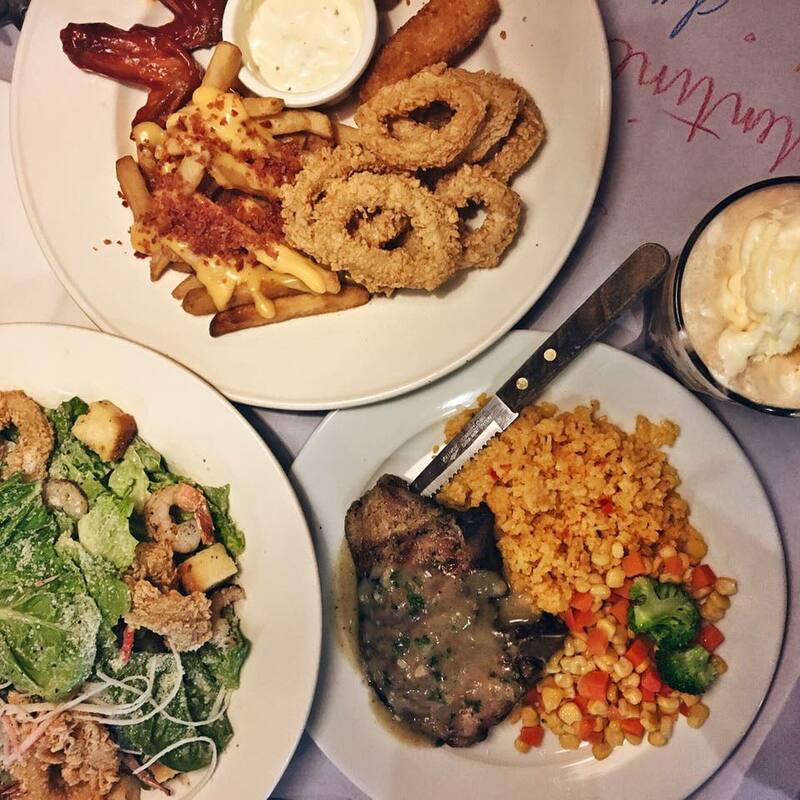 We’re lucky to be seated immediately at Burgoo. This restaurant has been our family’s favorite restaurant. And these are what we usually order: Ceasar Salad and Grilled Porkchop with rice and corn and carrots on the side. For that particular day, my mom ordered a different meal. My sister and mom shared the platter that contained calamari, fries, buffalo wings and mozzarella cheese sticks and we also ordered the pizza with 4 different flavors. What I like most about Burgoo is their big servings. If you haven’t tried it, you should visit it with your family. 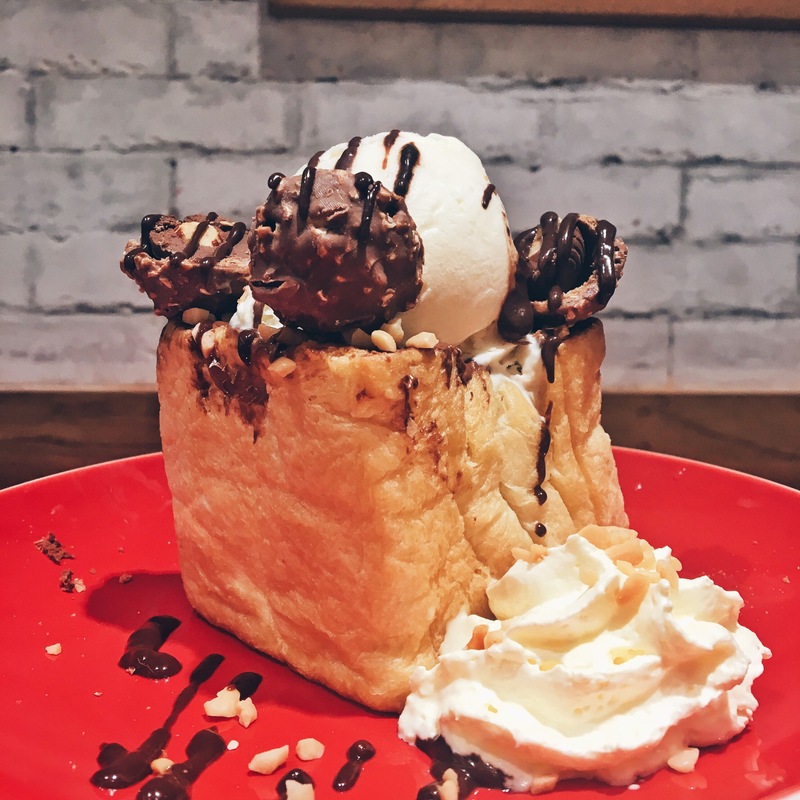 We tried Casa Italia just because it was newly opened in The Fort at that time and we’re looking for desserts right after we ate at Wrong Ramen. 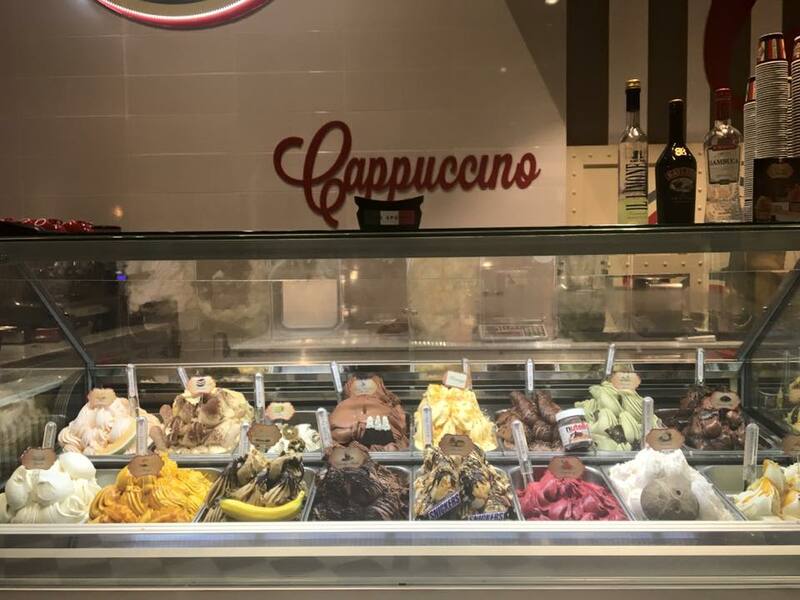 It was basically just like Gelatissimo but more expensive I think. Of course, my favorite part was the taste test of the flavors. In the end, we get to pick: Dark Truffle, Nutella and Cookies and Cream. I love their store in BGC, it was huge for an ice cream parlor. And they really have these enticing ice cream flavors. My PETA friends and I met up one Friday night in February. They chose Silantro in UP Town. 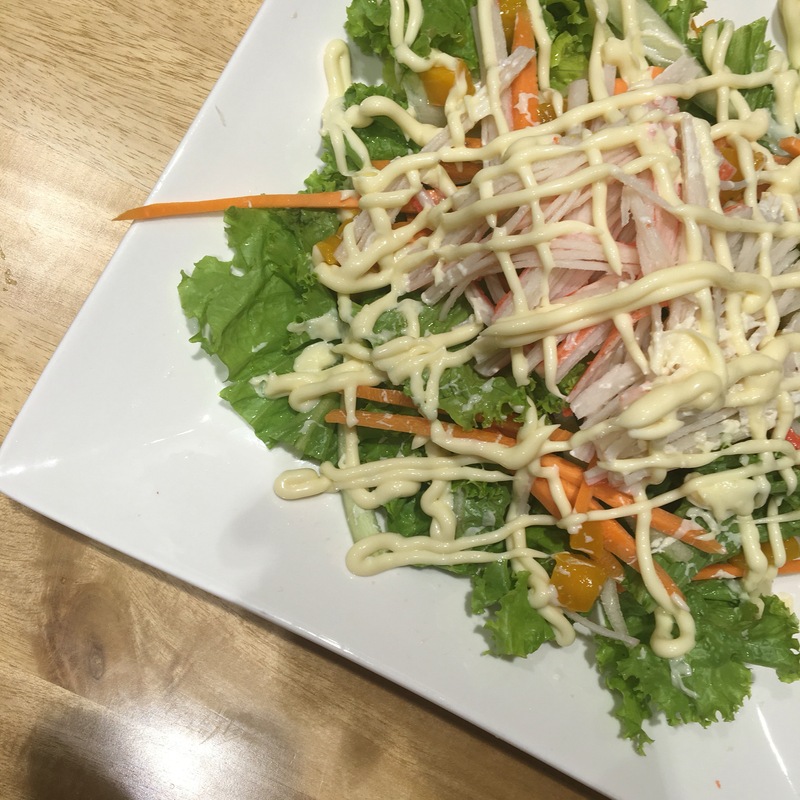 It was my first time to try it but I heard a lot of good feedback about the restaurant. The place was crowded at around 7PM, but we do managed to get a seat. 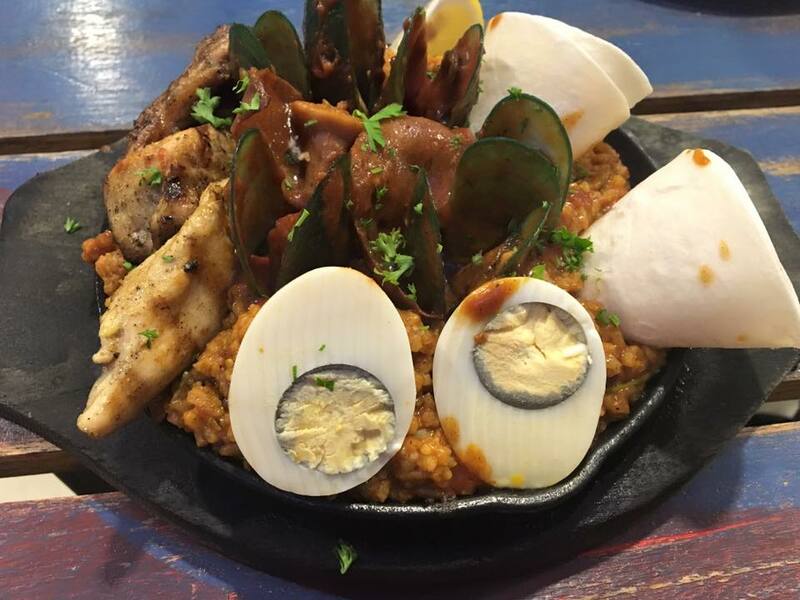 We ordered Silantro’s Paella Fajita Mix, Nachos and the Calliente Wings. I liked this paella amongst all the food that we ordered. It looked small but it was enough for the four of us (well, the other 2 didn’t eat much. I think I ate the largest portion of that Paella hahaha). 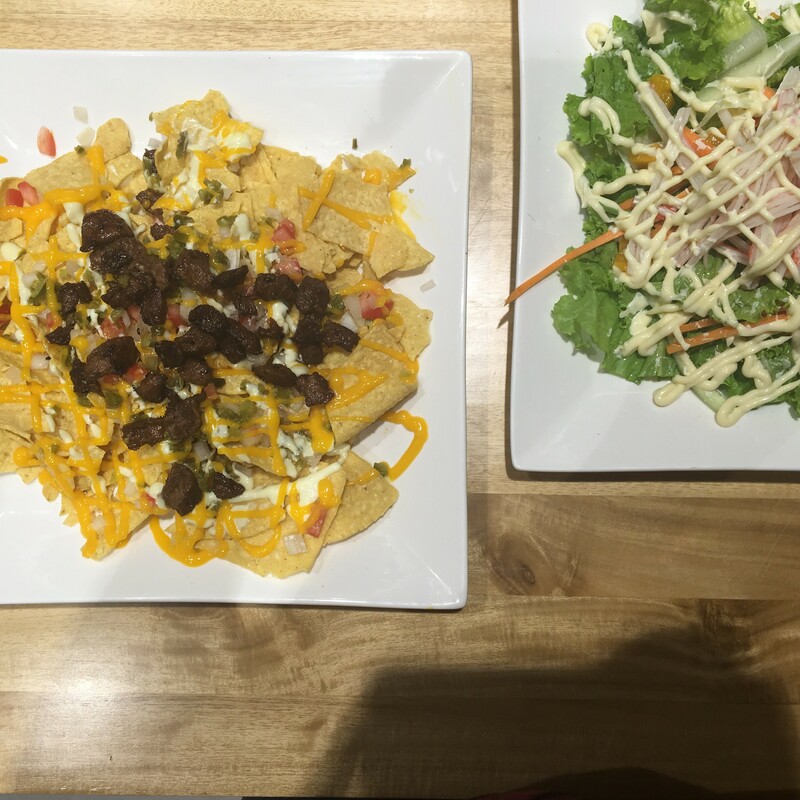 I didn’t like the nachos just because it has lots of veggies. But my friends liked it, so I supposed it was good. The place is ideal for get-togethers, they also serve beers and other liquors. Maginhawa is the place to be! But sad to say, North Wing MNL disappointed me. We visited the place during a holiday, February 25, around 5PM and the place was empty. That should have been a cue. Lol. Anyway, North Wing MNL houses 3 food stalls inside (maybe from the same owner): Sweet Eats sells desserts and drinks, West Steaks sells (yes you’re right…) steaks, and North Wing sells pasta, pizza and chicken. We ordered their Carbonara and Pesto, for the wings we tried Garlic Cheddar, we also ordered curly fries and Margarita Pizza (not in the photo). At that time, Margarita pizza was the only pizza available, so we have no choice. Amongst all the food that we ordered, I only liked the fries and the chicken. 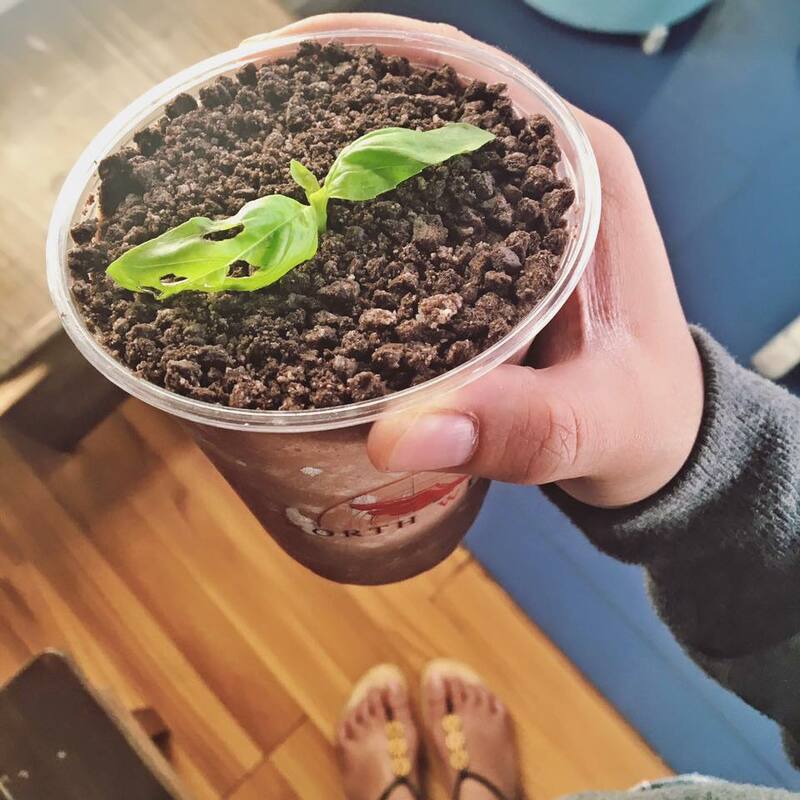 For the drinks, I liked Sweet Eats’ Pots. It gave justice to its name. You can really mistake it for a pot. There you have it! So that’s everything I stuffed into my mouth for the whole month of February. After my #FebruaryFoodie month, I vowed to make the next month as #MarchMagpapayatKaNaman. Hahaha but of course, I just continued eating. Because FOOD IS LIFE. Hahaha! 9 Things You Can Try When You Can't Fall Asleep. A Response to the Comments on my Rappler Article – Budget Itinerary: 6 days in Vietnam, Cambodia for 25,000.